(CNN)US cities as cold as the Arctic. An Australian inferno. The UK covered in snow.It’s only one month into 2019 and meteorologists are already talking in superlatives as extreme weather patterns have brought cities and towns across the globe to a standstill.In the United States this week, some 200 million Americans experienced a historic deep freeze that saw temperatures plummet below -32 degrees Celsius (-26 Fahrenheit), killed at least 17 people and led to the cancellation of more than 2,300 flights.On Thursday, temperatures in 11 states in the continental US saw temperatures lower than the one recorded in Utqiagvik, Alaska’s northernmost city, situated north of the Arctic Circle. 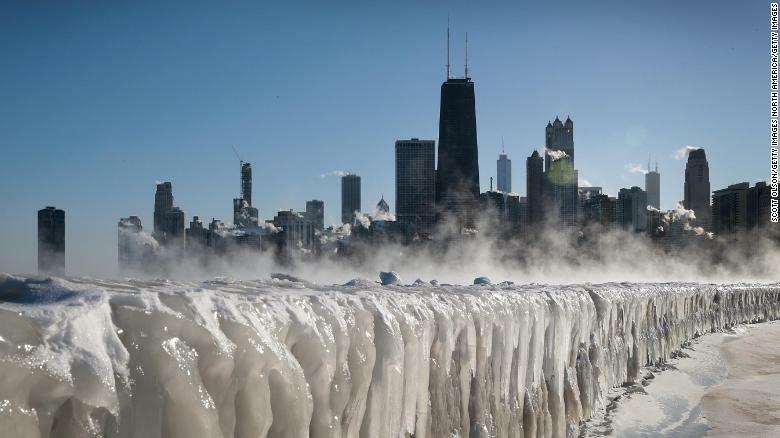 Ice covers the Lake Michigan shoreline on January 30 in Chicago as the city copes with record-setting low temperatures.Authorities in some of the hardest-hit cities such as Minneapolis and Chicago implored residents to stay indoors to prevent frostbite — in one Chicago hospital, doctors treated 50 frostbite victims; some may lose an arm or a leg.Across the pond, the United Kingdom recorded record lows this week as frosty weather pounded parts of England, Scotland and Wales.On Thursday, residents in Braemar in northeast Scotland experienced -14.4 C (6.1 F), according to the UK’s national weather service, the Met Office. This was the lowest temperature recorded in the UK since 2012.